With Aerial singer and songwriter Steven Newman, and his eponymous band Newman, will enter their third decade of creating music. Over the past twenty years the band has delivered ten studio albums, toured often, garnered many fans, and pleased music critics alike. Aerial should be no exception to either base. For the songs, all the aforementioned things will be self-evident. For a more heavier vibe, that slight metal edge, look to Fear Of Flying, High Tonight, or the bold riffs and brisk pacing of Always Stranger. For more of an AOR feeling, you might find it more prominent within Life To Remember, Vertigo, or Nothing Left where the brisk riffs are tempered by slight keyboards and large vocal arrangements. But mostly, everything here rocks, even if there are mellow breakdowns within songs, and the guitar solos are killer. If you like your classic melodic hard rock a bit heavier, with a metal edge, yet still AOR accessible, you will appreciate Newman's Aerial It's another strong release for the band. Recommended. 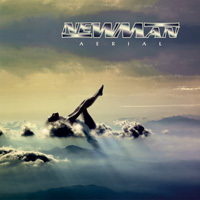 If you like your classic melodic hard rock a bit heavier, with a metal edge, yet still AOR accessible, you will appreciate Newman's Aerial The album is another strong release for the band. Recommended.